As a Brit, Indian food isn’t the first thing I’d think of eating for Sunday brunch, I must confess. However, 2014 started on a high note for me with a glorious five-week stint travelling around southern India, which meant I ate Indian food for breakfast, lunch and dinner. So, although Sunday brunch at home would usually comprise eggs, toast and maybe some bacon and HP sauce, I’m not averse to trying out new food and ways of being. Experimenting with one’s routine and palate keeps life interesting and fresh. Seems I’m not the only person in Brighton who likes to push the boundaries with exciting new food. Euan Sey and chef Kanthi Thamma, co-owners of Curry Leaf Cafe in Ship Street, have concocted a recipe for success in the form of tasty food and fantastic drinks for reasonable prices in a cool and funky venue. 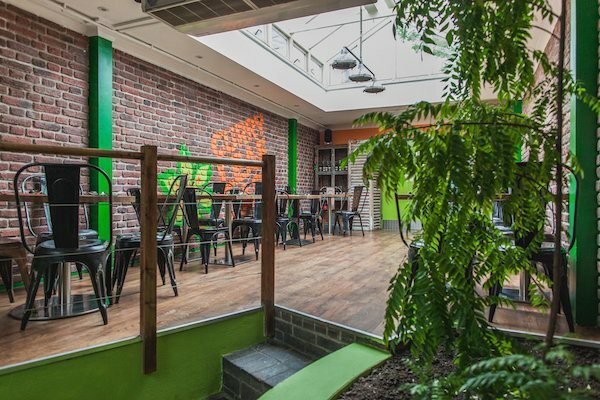 The cafe has proven popular since it opened in April attracting diners aplenty and glowing customer reviews. So much so, in fact, that the café recently won the silver medal as Best Newcomer in this year’s Brighton and Hove Food awards – a great testament to Euan and Kanthi’s vision and hard work. For Sunday brunch, there are dishes available from 10.30am to 3.30pm that are more breakfasty, as well as a parallel menu from 12 noon to 3.30pm that’s more lunchy. So, if you’re not much of an early riser at weekends (which I’m not) then you can pop along around noon or early afternoon, as I did, and take advantage of the wider choice. Mind you, what’s on offer from 10.30am is still tempting, and it took a while for my mother and I to decide what to have. 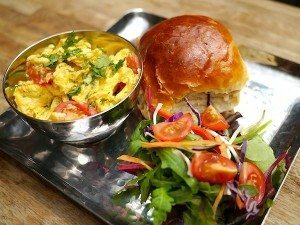 There are two egg-based dishes made with three free range eggs, green chilli, tomato, coriander leaves and onions, served with salad leaves and a buttered Indian roll. In the Andaa Burji your eggs are scrambled, whereas the Masala Omelette is as the name suggests. 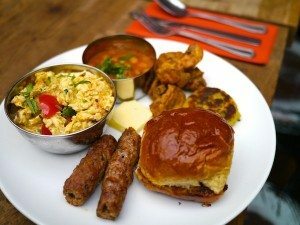 Other breakfast/brunch dishes on the 10.30am menu are the ‘Full Indian’ which includes spicy lamb mince seekh, mushroom bhaji, spiced potato cake, chana masala and spiced scrambled eggs served with a buttered Paav indian roll. Vegetarians need not worry – there’s a meat-free version too. An Indian breakfast/brunch menu would not be complete without a masala dosa and I was pleased to see this feature on the menu. My mother had never tried one before so we ordered one for our table, but more about that in a moment. On the lunchy noon menu there are two lighter options that make good starters –Masala Lentil Vadas and Karivepaku Kodi; crispy fried cubes of spiced chicken breast. 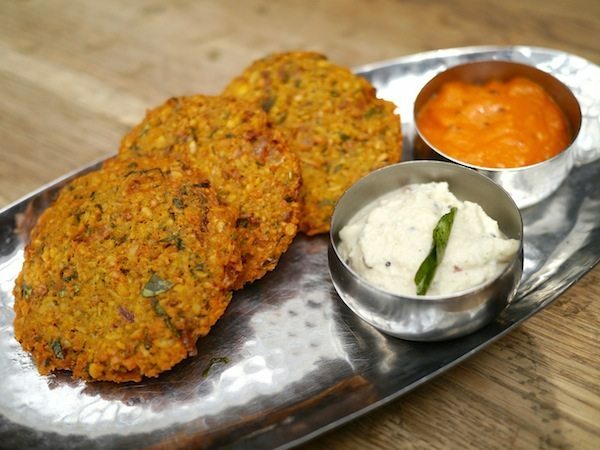 The vadas can be ordered on their own or as part of the street food platter, which includes a mixed vegetable pakora, mushroom bhaji and a mashed potato fried patty called Batate Ambade. 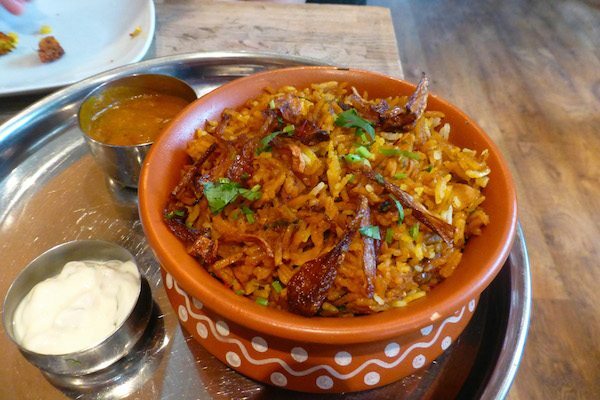 Hyderabadi biriyani made from basmati rice, spices and meat of the day. We ordered a masala dosa and a Hyderabadi biriyani and were going to leave it at that but Euan recommended we try the lentil vadas too. Vadas are deep fried ‘doughnuts’ popular in southern India as a breakfast or anytime street food snack. They’re usually quite fluffy and bland, as with normal ring doughnuts, but the addition of lentils at Curry Leaf Cafe creates a much more interesting taste and texture – smaller and flatter than other varieties and crunchy on the outside with a softer interior and nutty flavour. The vadas were a great suggestion from Euan; deliciously nutty and moreish. But what transformed the dish to heavenly heights was the combination of the vadas with the two chutneys – a luxurious rich, creamy one made with coconut which was truly divine, especially when eaten in contrast to the heat from its fiery tomato and ginger counterpart. 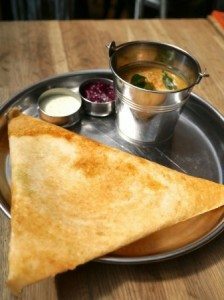 The masala dosa arrived on a big metal plate, having been folded into a giant triangle filled with potato, green pea and mustard seed mash. Alongside the dosa sat two pots of the above-mentioned chutneys (hurrah!) 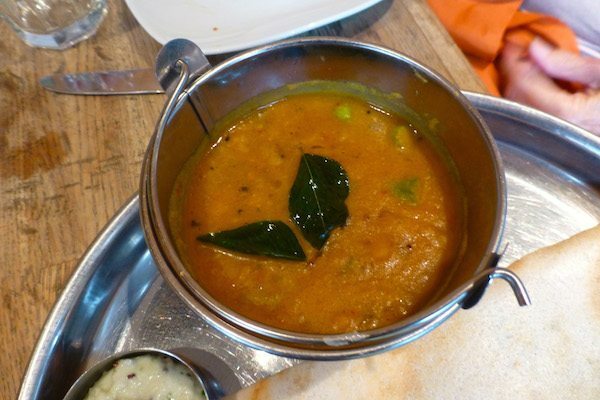 as well as ‘bucket sambar’ that was, as the name suggests, a sizeable bucket of lentilly vegetable curry. The dosa was as light as a feather and my mother got stuck in, pouring some of the sambar over the dosa and experimenting with different ways to eat the dish with the chutneys. She looked as pleased as punch. My biriyani was equally well presented – a pile of steaming spiced basmati rice in an earthenware bowl with crispy fried onions scattered on top, accompanied by cucumber raita and a spicy chilli and peanut sauce called mirchi ka salan. I plunged my spoon into the rice to find tender hunks of chicken. I ate a lot of biriyanis in southern India and Curry Leaf’s version is as good as any I’ve tried – the rice had been cooked and spiced to perfection and, as with everything else we tried that day, the side dressings really enhanced and complemented the dish. Portions at Curry Leaf café are generous, but our waitress offered to bag up leftovers to take home, which was a kind offer and one we were happy to accept. With little room remaining for dessert I chose a cup of milky chai tea, which turned out to be a very suitable way to end our meal. This review has been full of praise but I really couldn’t fault the meal in any way. Euan, Kanthi and their team have imbued their business with a lot of love and expertise and it shows, right down to every last detail. 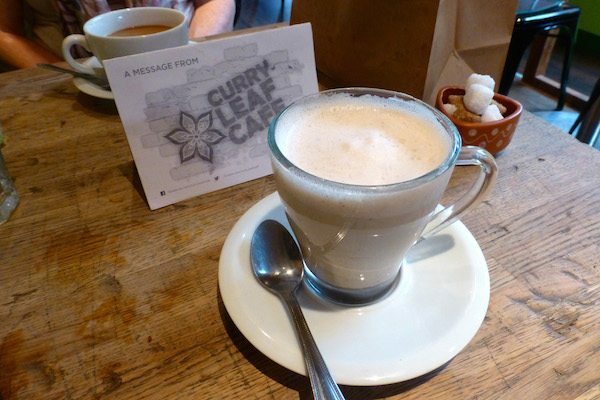 And so the chai reminded me of Curry Leaf Cafe – spicy, sweet and heart-warming. A guaranteed way to nurture the soul, come rain or shine. Brighton is blessed to have this place. I shall return very soon.